Hi there, my friend guitarist without engraved guitar picks yet. You and I have a passion in common. Don’t you feel a hero when playing your best shot? I do. I feel like nothing can take my guitar and I apart. Why don’t I create engraved guitar picks that would best fit my guitar? I am the one who is using picks after all: I can’t think of anyone else but me to design my engraved guitar picks. It was 2007 and I had just found my own brand EigenPlectrum® in the Netherlands. In 2014, I decided to invest in the production, adding new materials, more quality and more products for sales. EigenPlectrum® has worked side by side with their first customers to make sure they deliver the best quality engraved guitar picks on the market. Today, EigenPlectrum® is engraved guitar picks to the entire world. Design your very own engraved guitar picks. How to order your engraved guitar picks? Your order is placed and you will receive a confirmation email within a few minutes. You will also be notified when the shipping is ready to leave the Netherlands and you will be provided with a tracking number, to make sure you know when your engraved guitar picks arrive. But there is more. EigenPlectrum® offers free shipping for order of € 50 or more. When will I received my engraved guitar picks? Once you have placed your order, we will create and prepare your shipping within 10 days – depending on your order size. How many engraved guitar picks can I get? Again, we do not only sell engraved guitar picks. Want more out of your engraved guitar picks? Then, pick your product and upload the design you have created: you have just made your very first engraved guitar picks. 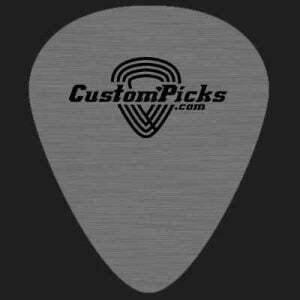 Why choosing engraved guitar picks? All of us guitarists – we share a talent, a passion, an experience. But all of a sudden, here we go again. That bloody standard pick just broke, one more time. That is why, since I started using my guitar picks with holes, I have never had the same problem again. EigenPlectrum® engraved guitar picks are made with the best materials on the market. Looking to promote the next concert of your band? Engraved guitar picks are a great and affordable way to advertise the event: they are even cheaper than printed flyers! Want to gift your fellow musicians in the band? Create a set of guitar picks, maybe with the band logo and your friends’ names. Your best friend is a guitarist and you are out of gift ideas? Buy them a guitar picks custom card: it will be an unexpected but appreciated surprise! There are a million reasons why you should order your engraved guitar picks now: you name them!